Group two: No. 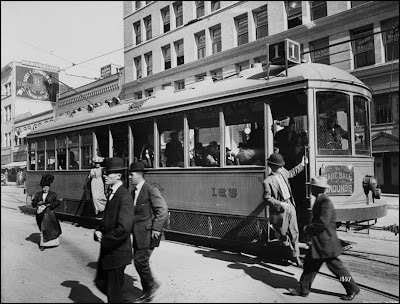 125, the other trolley photo in this blog, is from the SD History Center and it appeared with my November SDHG column. That 1913 b/w photo has made the rounds, but it remains fascinating and reminds us many of the original tracks are still in place under our current city streets. Century ago preparations were underway for San Diego to host the 1915 Panama-California Exposition in the then newly named Balboa Park. Never shy to seize an opportunity, magnate John D. Spreckels had his San Diego Electric Railway Co. commission the construction of two-dozen modern Class 1 streetcars (like No. 125) to make sure visitors arrived from downtown to the Expo in style. The innovative wider center of the car doors allowed on-and-off ease for larger crowds, especially those mode of day women wearing the short-lived but fashion rage called the Hobble skirt. Today, a few of the Class 1’s have survived--and maybe, just maybe--come 2015, these vintage streetcars might retro out of retirement to once again deliver visitors to Balboa Park’s anticipated Panama-California Centennial. Volunteers needed: www.sandiegohistoricstreetcars.org. BREAK A LEG, NORTH PARK!